Pumps come in different shapes and sizes. It even comes in various types and applications. Moreover, these pumps can be found almost everywhere. You can find a pump inside the car and it works by circulating the coolant that helps cool the engine. You can find it in farms with deep and shallow wells. You can even find it in lawns, gardens, and even parks. Pumps are everywhere and you use it everyday. Without these pumps, what do you think the world would look like? It would probably be barren, dry, and lifeless. Although the pump is not visible but it helps keep the water circulating all over the land. As mentioned,gasoline water pump come in all shapes and sizes and one of the most popular types are these small water pumps. These minute pumps can be found almost anywhere and have varied applications. 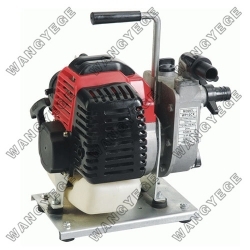 However, how to small Diesel High Pressure Water Pump work? The mechanism of action is more or less the same with its bigger versions. Pressure is used in order to move water from one area to another. For example, in a deep well, the submersible pump exerts enough pressure to push the water from the water table up to the surface. How small water pumps work is comparable with how a straw works. With enough pressure, the water from the bottom is sucked up and out. In simpler terms, these pumps siphon water out of one area and then transfer it to another. For a clearer picture, this method is applied when draining water from the pond and onto the soil or when you are draining water from the pool. However, other than that a small portable gasoline water pump can also come in handy when you have waterbeds. Yes, a small water pump can be powerful enough to drain water from this type of bed. You also use this type of pumps in small garden water fixtures like fountains. The pump keeps the water circulating and flowing through the hoses that are fitted inside the fountain.